If you're looking for something to read over the holidays, check this out. It's one of my favorites on my list of inspiring books. Registration is now open for the January, February and March Live Staging Diva TeleClasses. I only take 15 students in a conference call. All notes are emailed to you in advance. You get a phone number and password to join your fellow students and me in the live calls on the 5 designated evenings. Get the winter 2008 schedule and register before it's full. Make sure you read December's quote of the month in the left column. I don't know about you but I get a chill of excitement contemplating Stephen Covey's approach to life. It makes anything possible! I've just been booked to shoot an episode next week on home staging for a new HGTV show that airs this spring. I'll keep you posted on the name of the new program and when to catch it as soon as I have all the details. I'm also hoping to negotiate the rights to have clips of it on my site (but this can be tricky). My "holiday" plans include trying to complete the new site for the Staging Diva Art Shop, finishing writing the Home Staging Design Guide and catching up on my reading. There are also plans for much holiday baking (which I know my trainer wouldn't approve of, so much for losing that last ten pounds). I hope you find the content of this issue of Staging Diva Dispatch helpful. I welcome your feedback and/or new story ideas! Best wishes for the holiday season and may all your dreams come true in 2008! P.S. If you missed the Preview session I ran in November, you can listen to the recording here. "What," you say, "is she crazy? I'm too busy at this time of year to think!" I spend many of my days feeling overwhelmed by what's already on my To Do list too and the thought of sitting quietly to think is nowhere near the top of my list either. But when I do manage to carve out a quiet space for myself, I'm always richly rewarded. Every time I hear myself think, "I have no time," I remind myself that a close family member literally has no time because she's so ill. Suddenly the busy stuff of life seems so irrelevant. How can I consume my own life with matters I won't even recall a month from now? I'm sincere in my mission to inspire and empower others to live their best life. Take the time to check in with yourself and see if you really feel like you're on the right track. If you need to adjust how you are doing things, then do it! As Diane Sawyer wisely said, "the dream is not the destination but the journey." Set aside 45 minutes just for you. If the dishes pile up in the sink, or you bake one less recipe, or you don't get around to washing the car, so be it! Now is the time to think about what you've accomplished over the past year and how you'd like your life to look by next Christmas. Why do I want to be a home stager? What are my goals for the next year (financial, personal)? What am I most afraid of and how can I get the resources I need to address these fears? What were the happy surprises this year (financial, personal)? What have I found disappointing? Were my goals too optimistic or did I think too small? What can I do differently (or where can I get the support I need) to have better results in the coming year? I've reinvented my own life many times. It wasn't by accident, it was by design. It happened when I set aside the time to figure out what I wanted and how I could make it happen. I don't believe it's possible to build your life around your passions and create the work you were "meant" to do without personal reflection along the way! So, I hope you'll take up this challenge to carve out 45 minutes in a hectic season to contemplate what's REALLY important to you! Most of us already have too much "stuff," and with the holidays coming friends and family struggle with what to buy us, and having the time to go shopping. Staging Diva Gift Certificates enable the people in your life to help you get closer to realizing your dream of starting and growing your staging business. Once purchased, the buyer receives an email with a link to your Gift Certificate. All they need to do is forward that email to you and you can redeem your Gift Certificate towards the purchase of any Staging Diva product or service! I'm sure you can think of a few people in your life that would welcome the opportunity to support you in your dreams and appreciate the idea of not having to drag around a shopping mall to find you a meaningful holiday gift! You can redeem the Certificate on any purchase, so if they send you $20, $40 or $100 you can use it towards any item of greater or equal value, it's entirely up to you. This bathroom was transformed into a warm and inviting space with paint and a few accessories including bamboo stalks in a bud vase (which eventually take root and last forever) and chocolate brown leather covered baskets to contain all the typical bathroom clutter. Prospective homebuyers don't want to see toothbrushes, cosmetics and other personal care items. 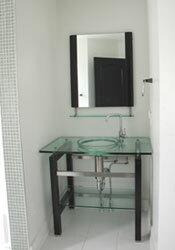 Think "luxury hotel bathroom" when staging no matter how average the space you have to work with is. 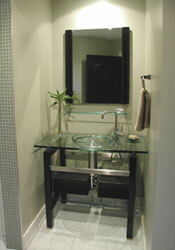 Fluffy towels, shower curtains, paint, cabinet hardware, towel bars, etc., can make a world of difference. Here I used Benjamin Moore Ultra White on the ceiling, White Diamond (OC-61) on the trim and Gray Mirage (2142-50) on the walls. Congratulations to Staging Diva Graduate Jean Smith of Staging For Sellers (FL) who at the age of 76 decided to follow her dream of a new and creative career. Within weeks of completing the training program she already had two projects and wrote, "I'm so happy to be starting a new business at my age!" You can read her story here. Congratulations to Lea-Ann Virnig of Home Beautiful Designs who took leadership in forming a coaching group using the F/ree chat feature that comes with membership in the Staging Diva Network. Each Wednesday at 9 PM (central), members can meet up in the chat room to share ideas and set goals for the coming week. Committing your goals to others who expect you to follow through is an excellent tactic for moving your business forward. The group offers support and encouragement to help everyone grow their businesses. All Staging Diva Network members are welcome to join this f/ree weekly chat group! Susan is the first Staging Diva Graduate in her state and is looking forward to pursuing her creative side after over 8 years in real estate. Congratulations to Tiffiny Coffey, Scarlet Barn Interiors (ID), for completing her Staging Diva Business Coaching sessions. Tiffiny used our time together to set specific goals. Each coaching session she reported back on her progress and set new targets for the weeks ahead. Only three months after joining the Staging Diva Directory of Home Stagers, her company comes up in the top 20 listings on a Google search for home staging in Idaho, Boise, Treasure Valley and the other areas she serves! Tiffiny is certainly paving the way for her new business to take off in early 2008! Congratulations to Staging Diva Student Carla Savko (CA) who by the end of course 3 of the November Staging Diva Live TeleClasses, already had her first paying client. Carla writes, "30 days ago I hadn't yet heard the phrase 'home staging' and now I've got what I need to turn my decorating talent into a business. The courage to take on this project came from what you've taught us so far. I knew how to turn this prospect into a paying client during our first phone conversation, because of the script you gave us during last week's class. I followed my notes and it worked!" Congratulations to Graduate LaToya McPherson, Seven Divine Home Staging & Redesign (ON) who completed the training program in September and already has her new website up and running! She writes, "I just want to thank you for being an inspiration to me. Like you, I truly understand what it is to have an innate passion to succeed and to want to be in control of your own destiny. Debra, I consider you my mentor and appreciate the guidance you provided in the training materials. Thanks for making the Staging Diva program so seamless to take!" With a readership of over 2.4 million, when Entrepreneur Magazine declares Home Staging one of the h0ttest business opportunities, you can bet people take notice! Not just aspiring stagers, but the millions of homeowners who need our services. Staging Diva is the only home staging business opportunity recognized by Entrepreneur Magazine in all of their Guides to Business StartUps for the last three years running. 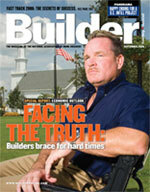 This lastest issue, Winter 2008, is on newsstands until January 29, 2008. In October of 2006 I was interviewed for a story on how to find a home stager. 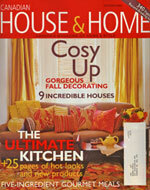 The story lives on at the House and Home website with a link back to the Staging Diva Directory of Home Stagers! Special thanks and a f/ree gift is going out to Staging Diva Graduate Ruth Maracle, Dynamic Designs for finding it for me!